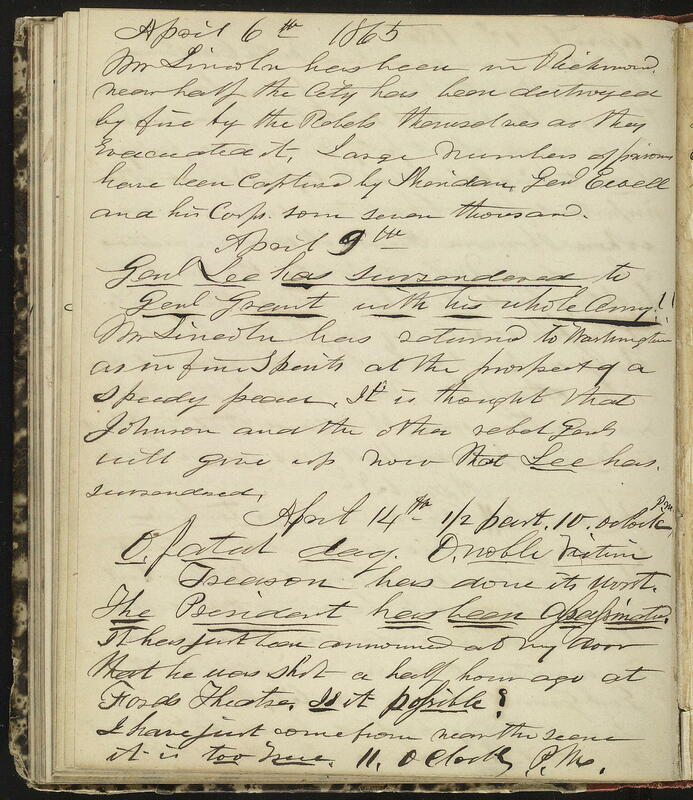 This excerpt from the diary of Horatio Nelson Taft is an insight into some of the first reactions of citizens of the Union to the death of President Lincoln. Taft, who was a patent clerk, laments Lincoln's teach and denounces the assassination as assassination at it's worst. In the entry just prior to the excerpt describing Lincoln's death, Taft described the return of Lincoln to Washington after a Union victory. by Sheridan, Genl Ewell and his Corps, some seven thousand. and the other rebel Genls will give up now that Lee has surrendered. April 14th ½ past 10 o'clock P.M.
O, fatal day. O, noble Victim. Treason has done its worst. The President has been Assassinated. that he was shot a half hour ago at Fords Theatre. it is too True. 11, o'clock P.M.